Merry Christmas, Y’all. I just love working with the mini charm packs, don’t you? 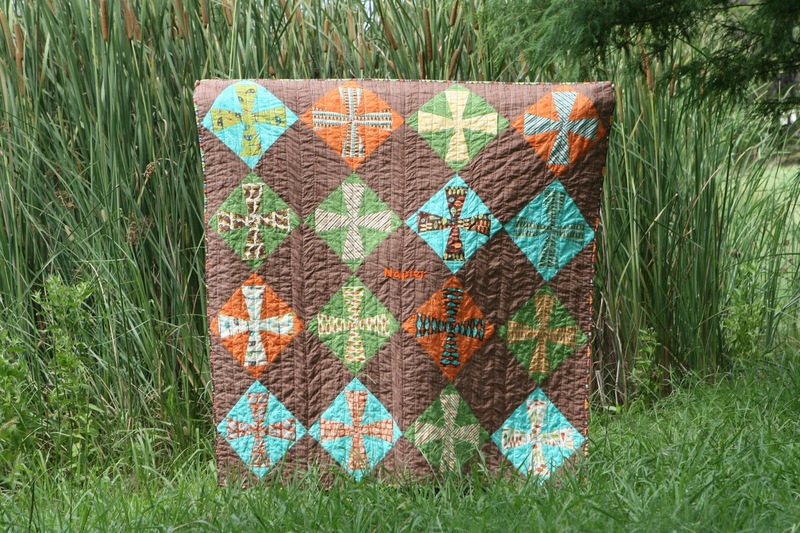 You can purchase a complete kit for this project from Red Rooster Quilts. Click here to order. 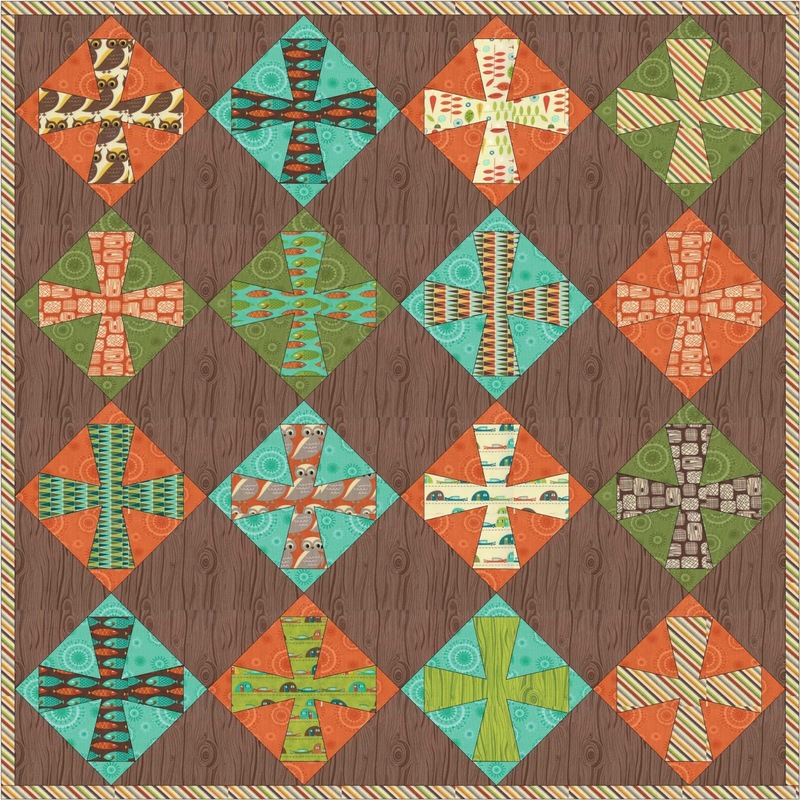 Enjoy this mini charm quilt. From the background fabric cut 3 – 2 1/2″ strips. Cut 30 – 1 1/4″ x 2 1/2″. 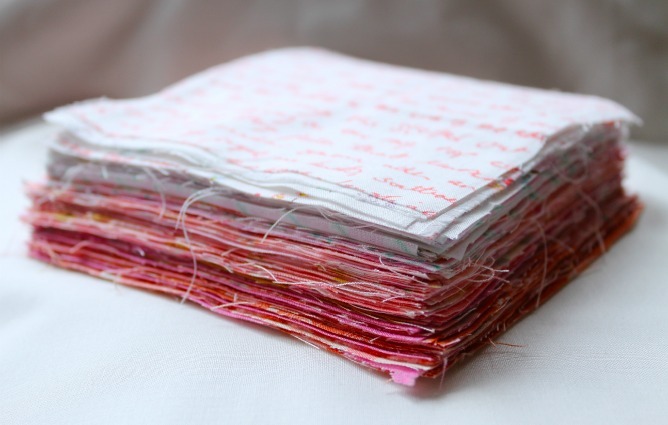 Cut 30 – 2 1/2″ squares. 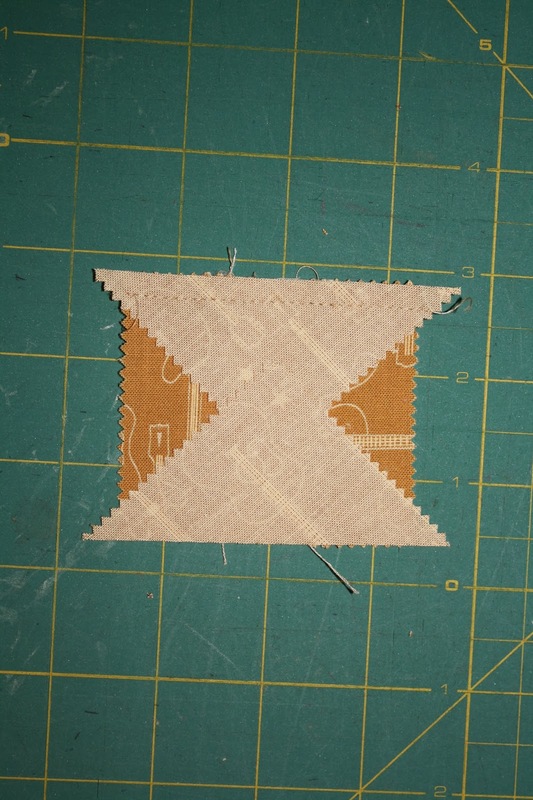 Then sew on the other background triangle on the opposite side. Trim to 3 1/2″ square. Layout blocks in 6 rows with 5 blocks each. Sew blocks together into rows. Sew rows together. 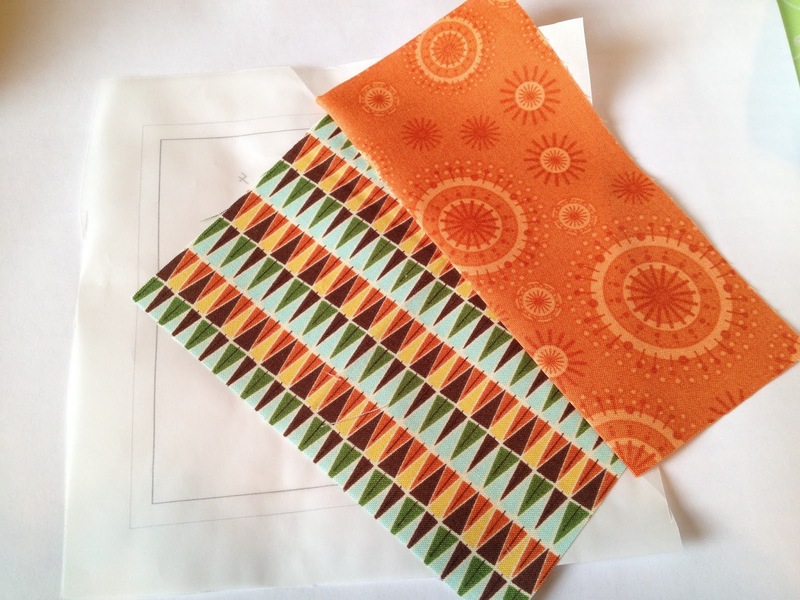 Inner Border: Cut 2 strips 1 1/2″ wide. Sew inner border on to sides first then top and bottom. 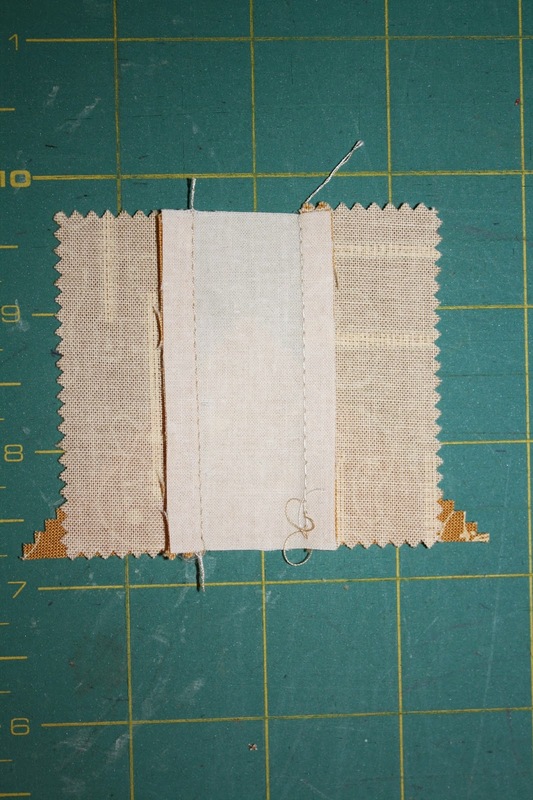 Outer Border: Cut 3 strips 3 1/2″ wide Sew inner border on to sides first then top and bottom. 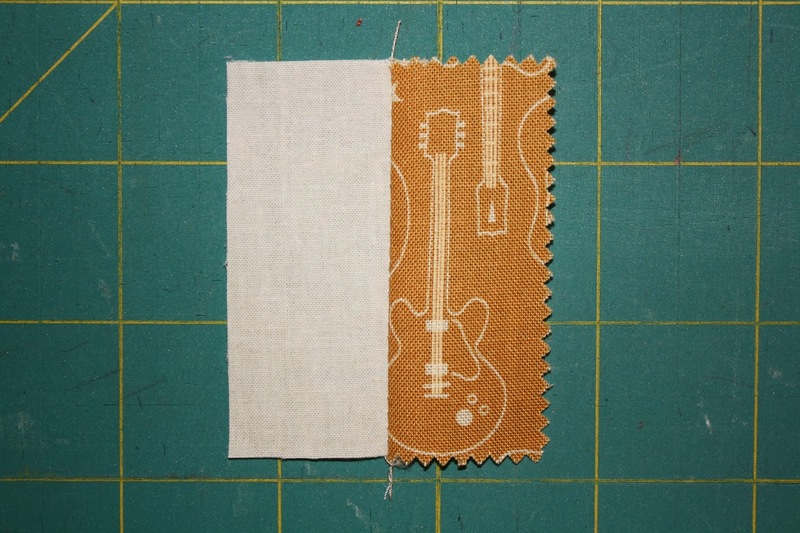 Layer with backing and binding. Quilt as desired. Binding: Cut 3 – 2 1/4″ strips. Sew on binding with desired method. 1 mini charm quilt approximately 23″ x 26″. Look what you can make if you change the color placement. How about this cute arrow with some hearts for Valentine’s Day? Please visit us at www.redroosterquilts.com or stop in our store. Hi, I’m Stacey and I blog at The Tilted Quilt. 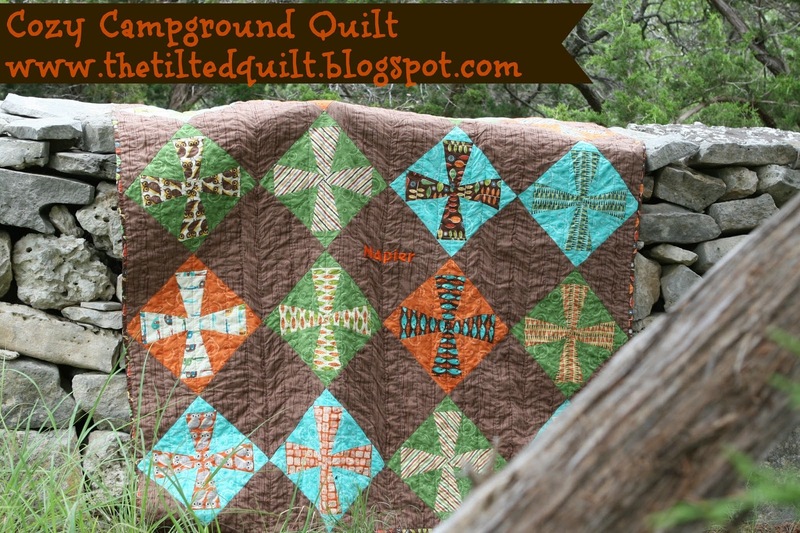 Today, I am sharing a Cozy Campground Quilt with you. I have two young sons and my husband is just dying to begin taking them on camping trips. From the moment I saw the S’more Love line by Eric and Julie Comstock, I knew I had to have it. It will be a perfect family quilt to take with us to have out in front of the campfire while we are making S’mores. I made sure to use a dark background and backing since I know this quilt will get lots of outdoor use! 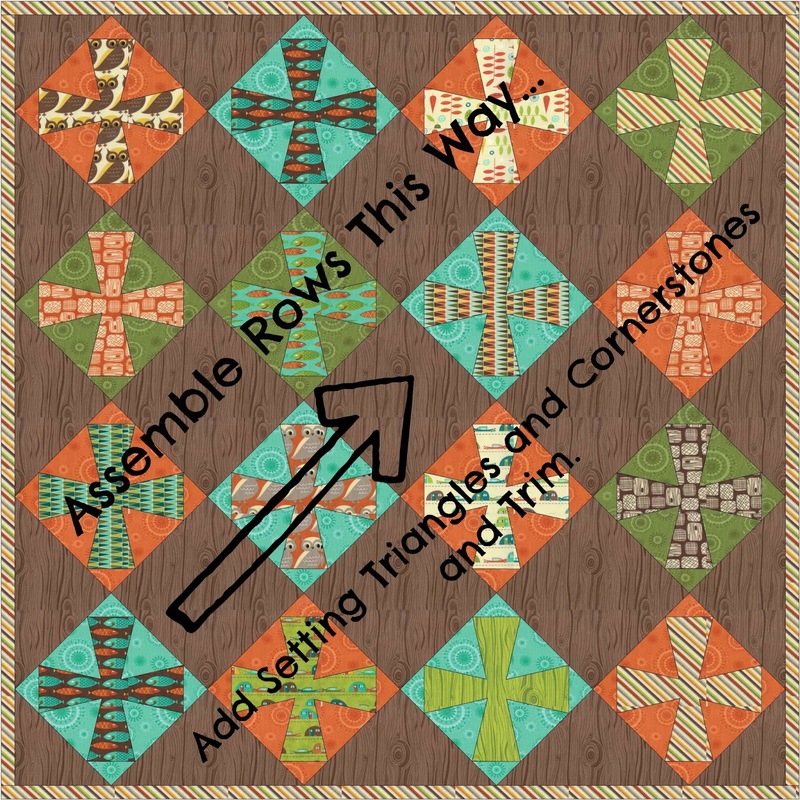 This is a great pattern if you have not foundation pieced before and you want to dip your toe into this technique. 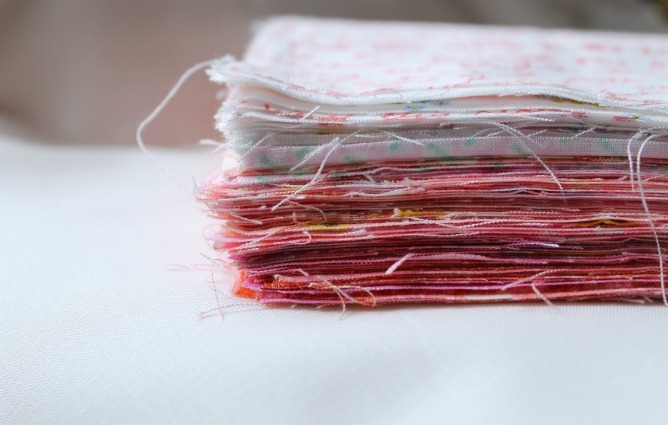 I am going to give away my scraps from this project (including a nice size bundle of 10 leftover fat eights) – just swing by my blog over the next week for a chance to win. 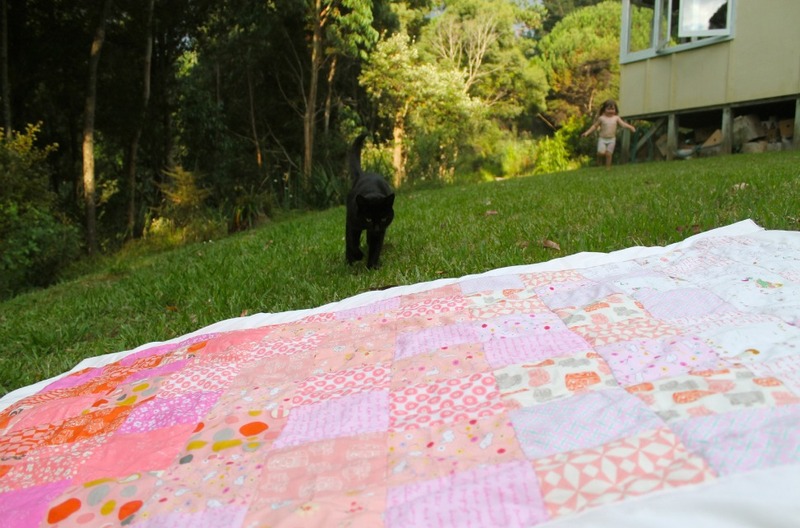 All fabrics in this project are from S’more Love. 6 inch Add-A-Quarter ruler – this is not mandatory, but I couldn’t live without mine. I use a lightweight paper called vellum for my foundations, but you can use whatever you prefer. You will need 64 copies of the block pattern (16 blocks x 4 sheets per block). 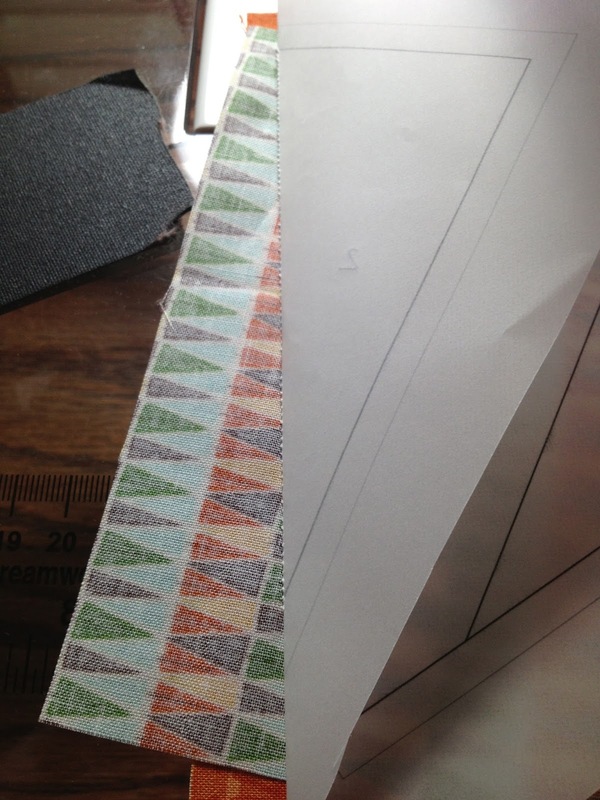 Print at 100% or “actual size” – the pattern block should measure 5 ½ inches on each edge, for a 5” finished size. 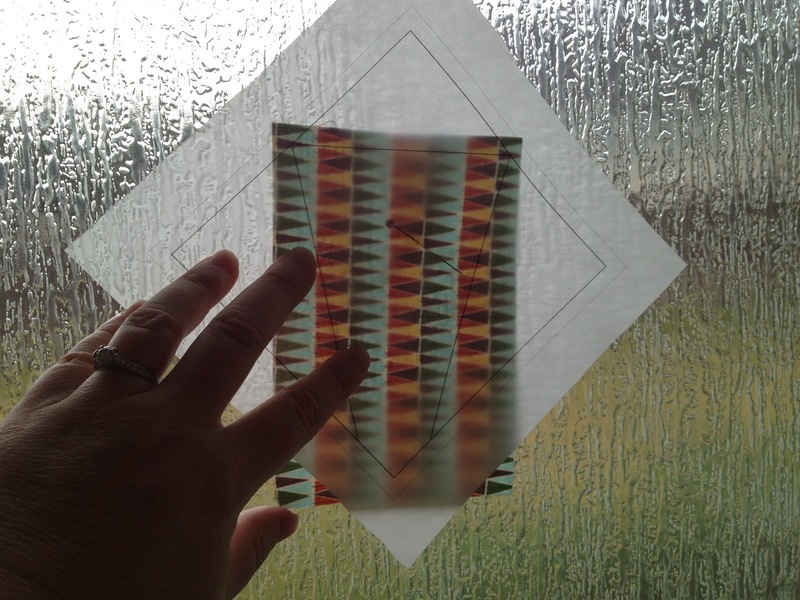 I have included a 1″ test square so you can make sure you are printing the correct size. To be safe, you should print all 64 of your pages at one time – just in case you accidentally change the page layout between printings (I speak from experience here!). Download the foundation pattern here. 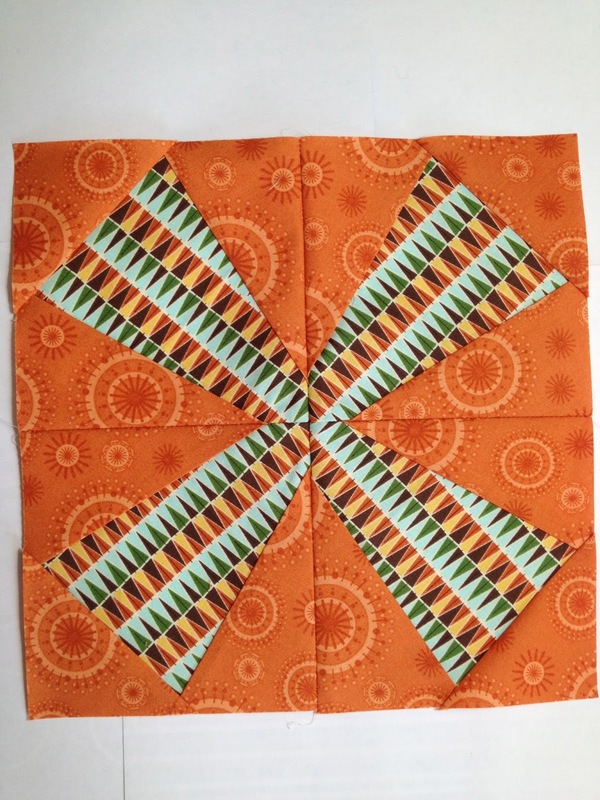 *If you are using a fabric with a directional print where the orientation of the design matters, keep in mind as you cut that you will be laying these out on the diagonal. You may want to wait to cut these squares until you lay out the quilt below. 2. Choose 16 prints from the fat eighth bundle. 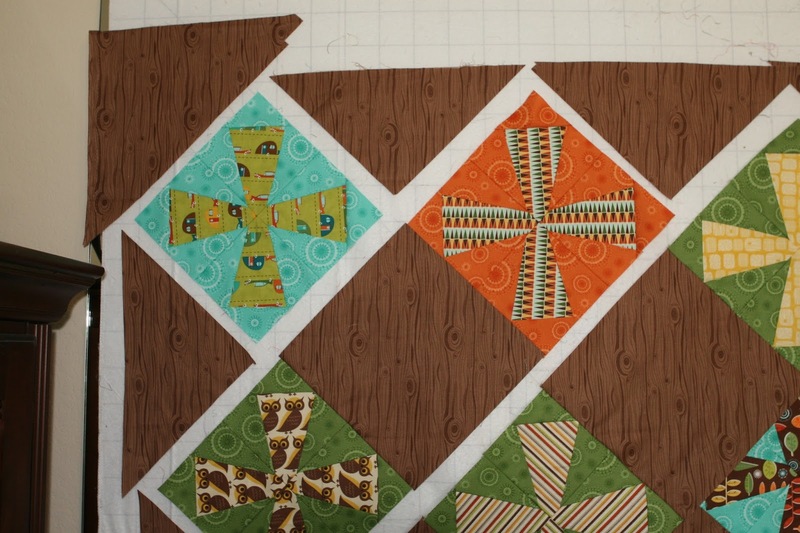 Each 10” finished “X” block is made from four-5” foundation pieced blocks. Piece 1 is the block print and Pieces 2-4 are the block background prints. 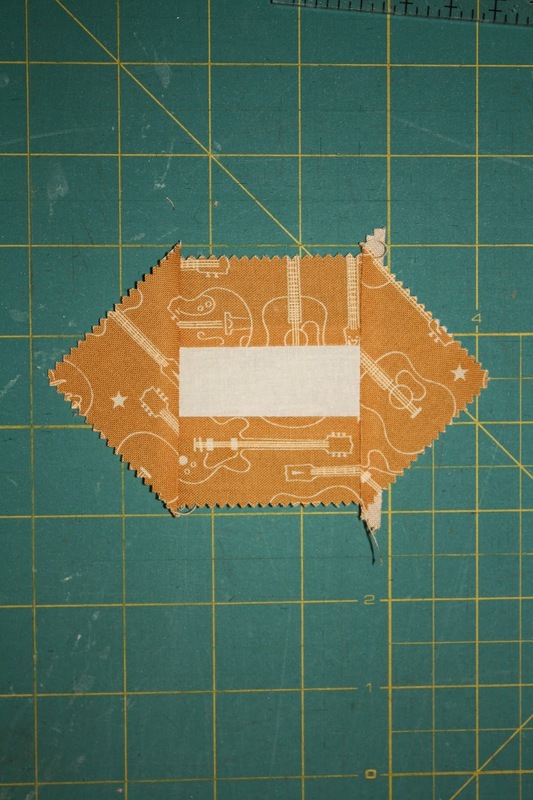 When sewing on a paper foundation, remember that you will be sewing directly on the printed side of the paper with the fabric on the “un printed” side. 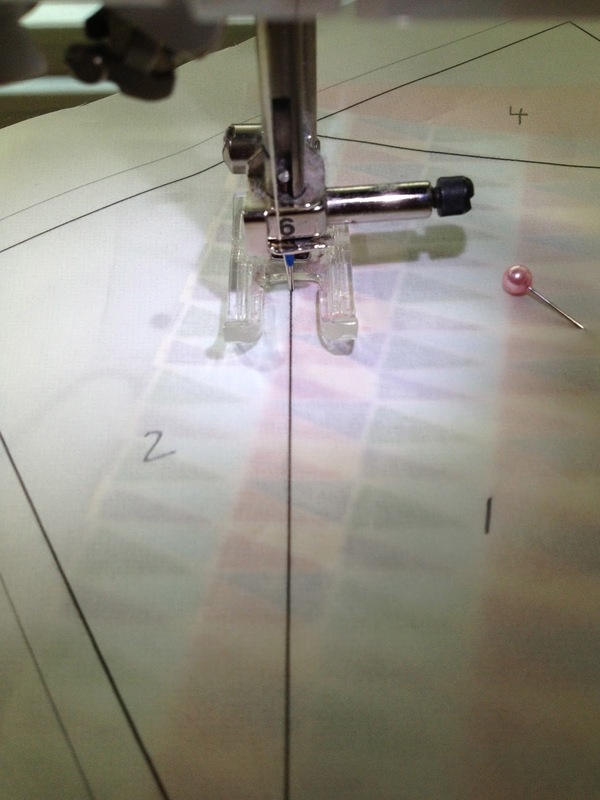 Lower your stitch length to 1.6 or 1.8. 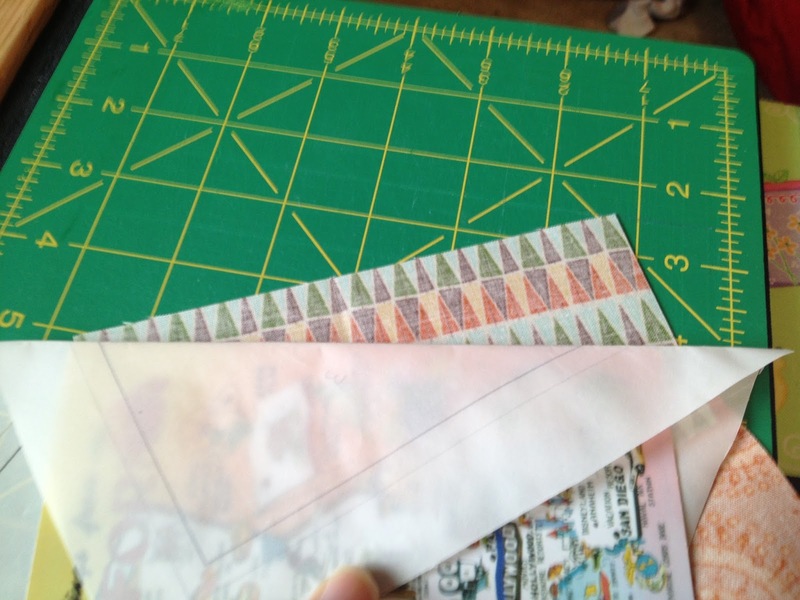 For some additional tips on paper piecing, check out this tips post I did earlier this year. 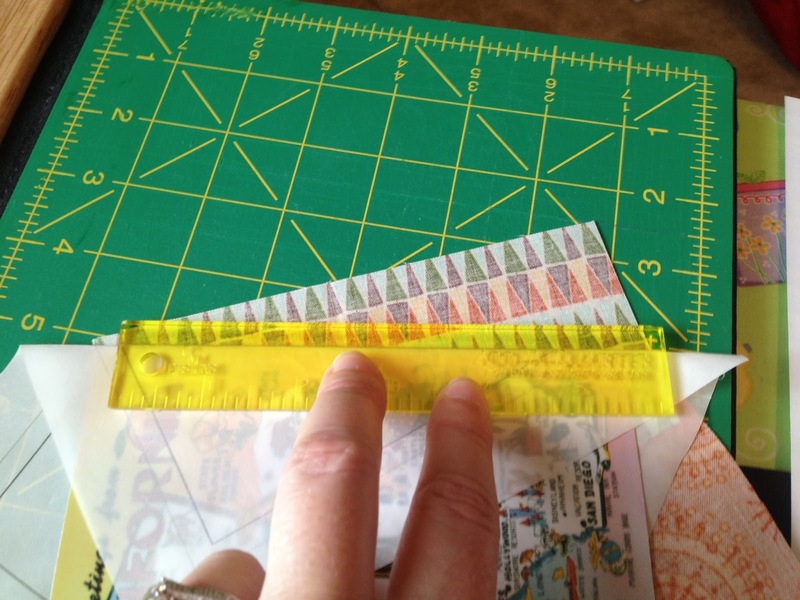 That post also links to a video tutorial using the Add-A-Quarter ruler for trimming. 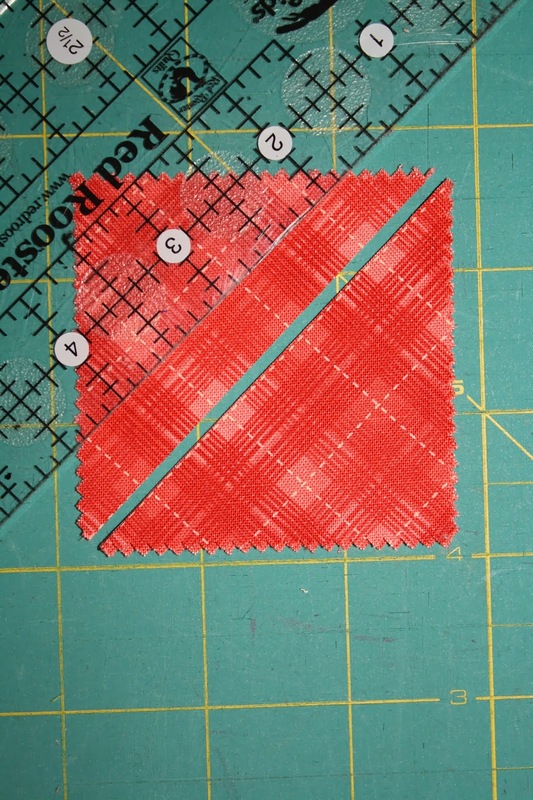 To create the block: Choose a piece from your cut fat eighth stack – place piece 1 with the right side facing away from the paper so that it covers the center wedge entirely – making sure that there is at least ¼” excess around all of the lines. You may want to hold it up to a light source to make sure the lines are covered. I like to put in a pin to make sure this piece stays put. 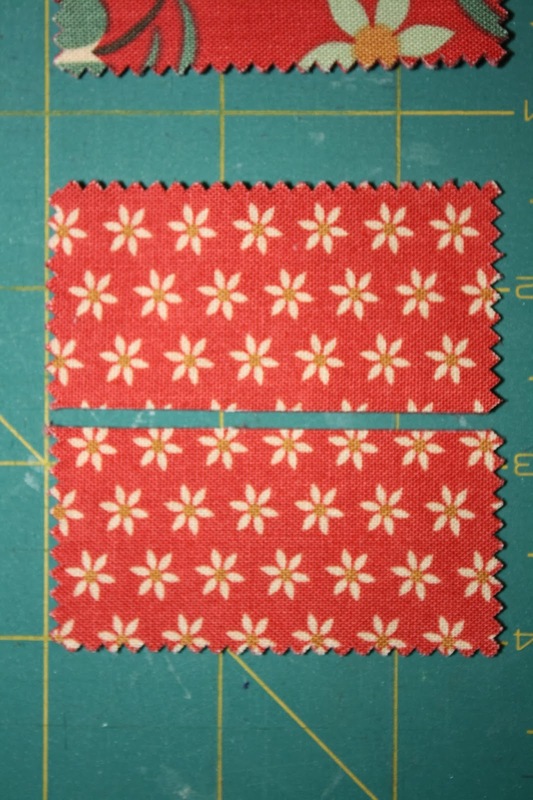 Your second piece of fabric is a background piece – it will be placed with the right side of the fabric facing the right side of the first piece of fabric you pinned. You will be sewing on the line between piece 1 and 2. 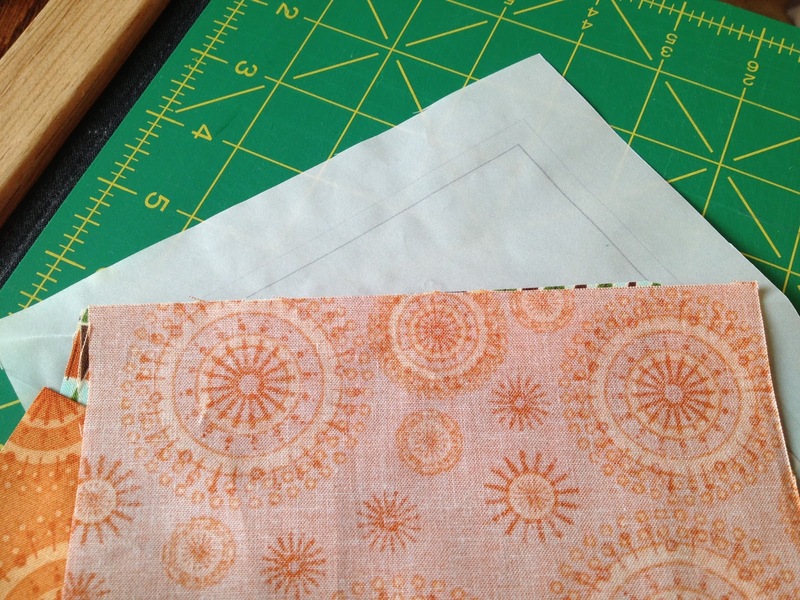 Make sure the length of the background fabric extends a full ¼” past the edge of the block on both sides and that, when flipped over, it will cover the full corner of the block, including the ¼” seam allowance. Using an open-toe foot (or your regular piecing foot if you don’t have an open-toe foot) begin sewing the line between 1 and 2. Backstitch a few stitches at the beginning and end to lock in your stitch. 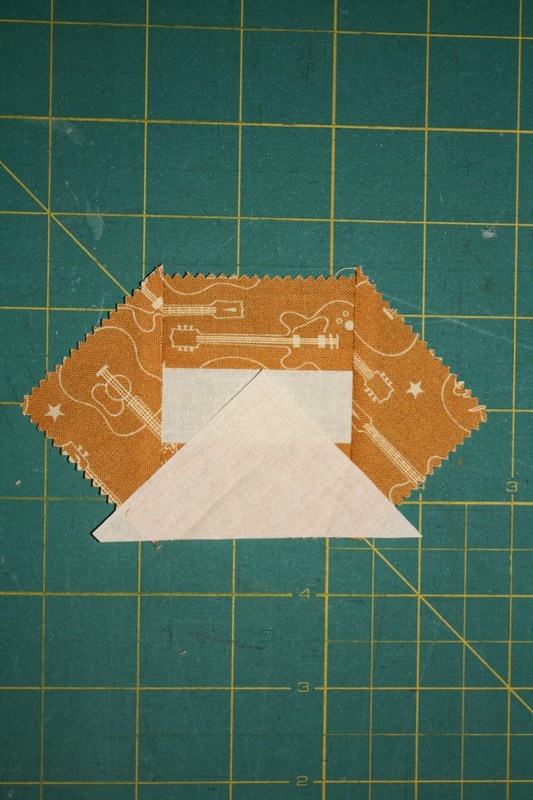 Before you flip over Piece 2, trim the excess away (leaving ¼” seam allowance) by folding back the paper. 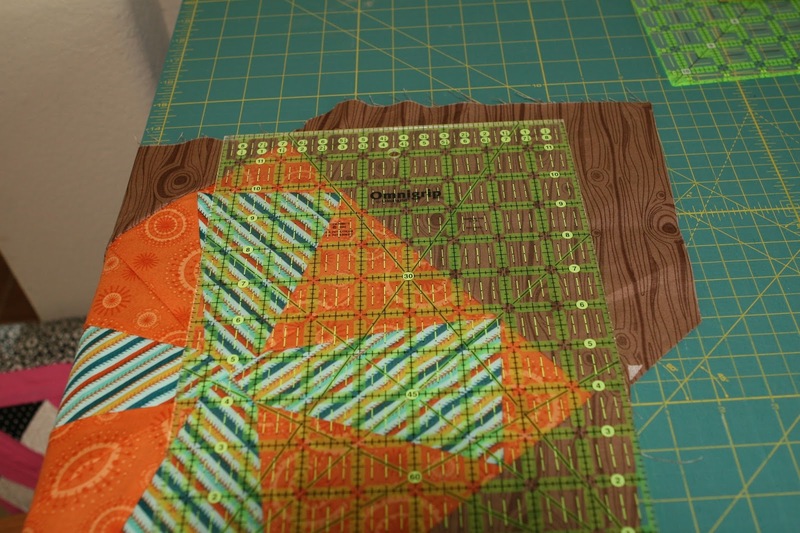 Next, you will want to trim ahead of your next piece to keep that nice ¼” seam. I really love using an Add-A-Quarter ruler. I will demonstrate how it works. If you don’t have one, continue to trim as you did in the previous step, after you sew the seam. On the paper side, take a postcard or index card and place it on the line between 1 and 3. 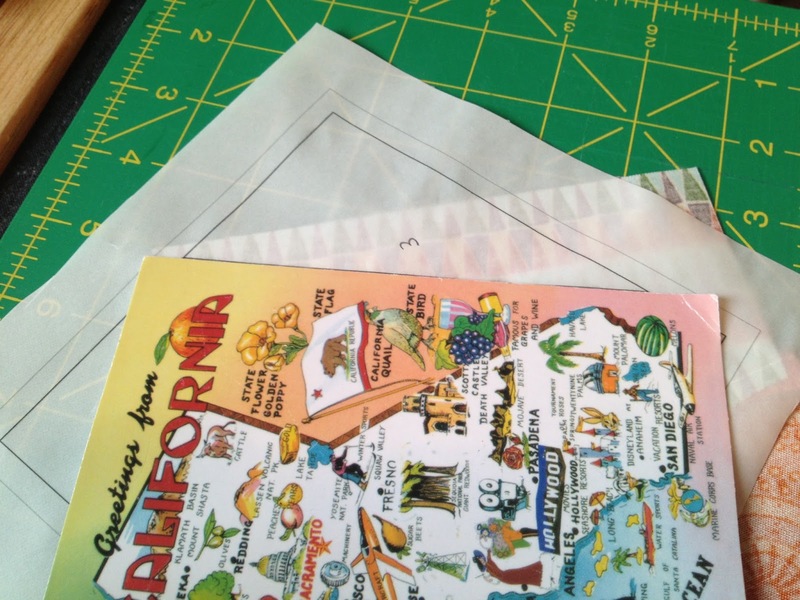 Fold the paper back over the postcard creating a stiff edge. Place the Add-A-Quarter ruler on the postcard edge. 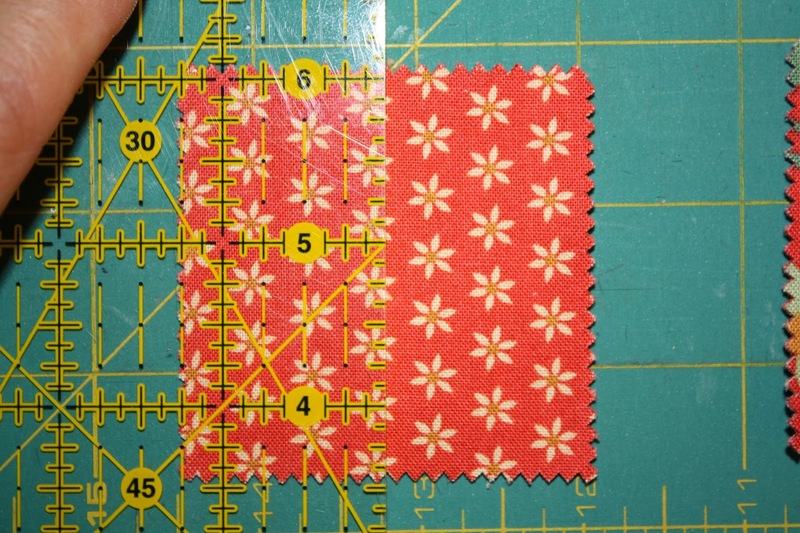 Trim to a perfect ¼” seam with your rotary cutter. Fold the paper back up and flip the block over. 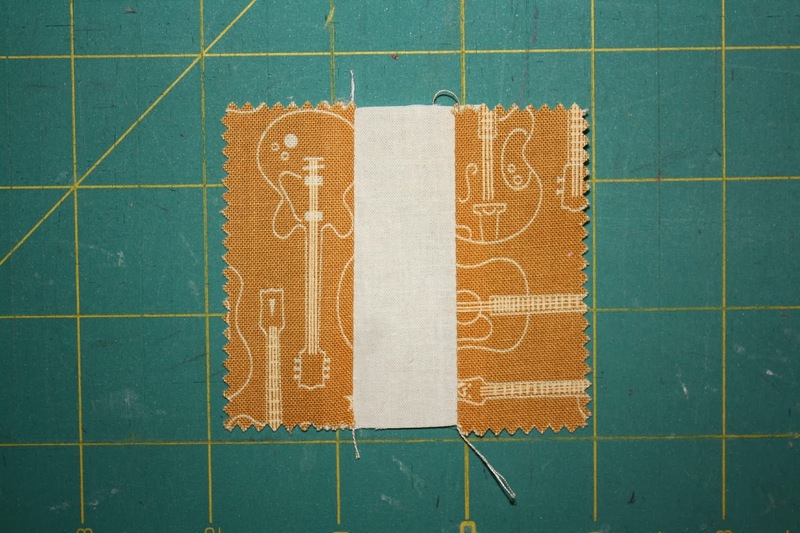 Now you can line up your next piece directly on the cut fabric, right sides together. 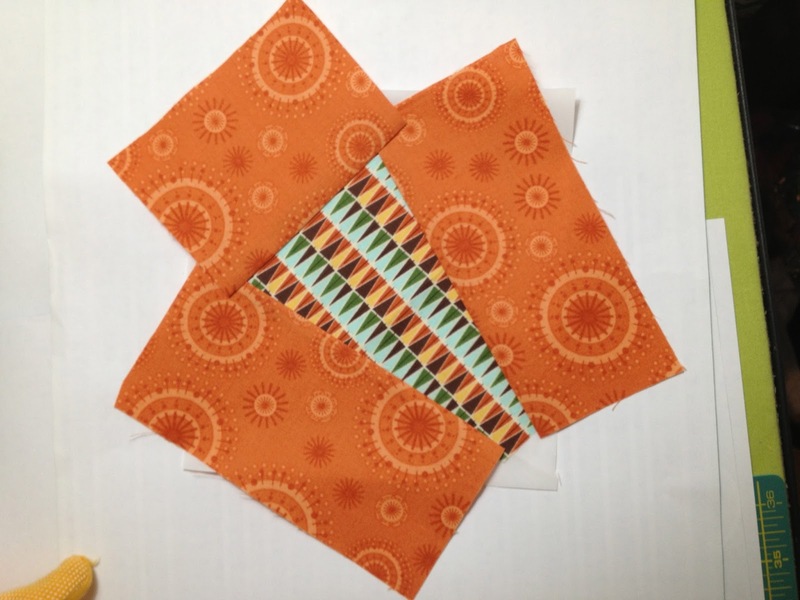 Flip the block over and sew on the line between 1 and 3. Remember to backstitch at the beginning and the end of the line. Flip the fabric over and press. Repeat the steps above to trim the line between 1 and 4 with the Add-A-Quarter Ruler. Add piece 4 along the cut edge of 1, right sides together. 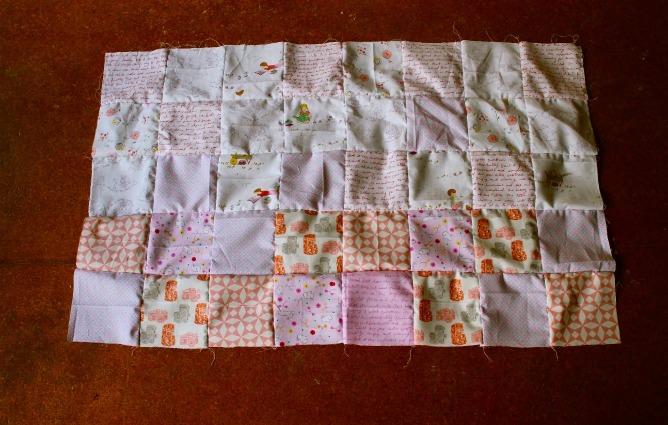 Flip block over and sew along the line between 1 and 4. This is what your block should look like now. 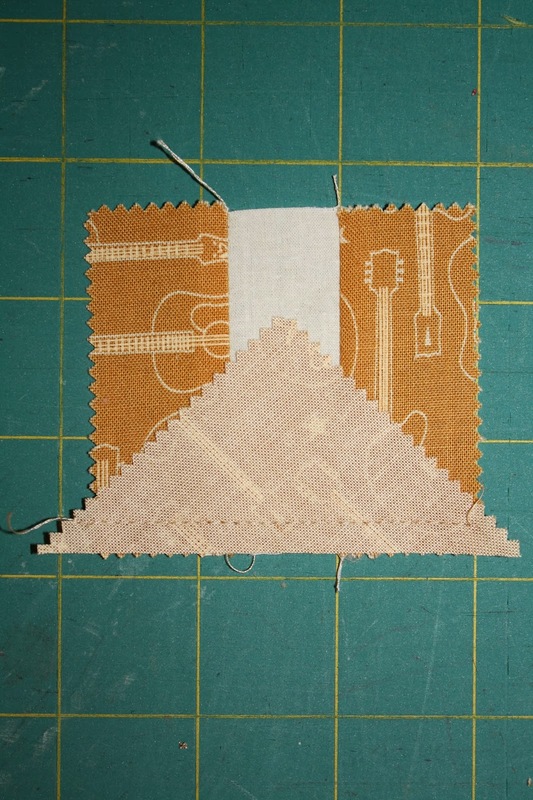 Flip the block over and trim away excess – cut on the OUTER line (this includes a ¼” seam allowance for the blocks). Now, you have a trimmed block. 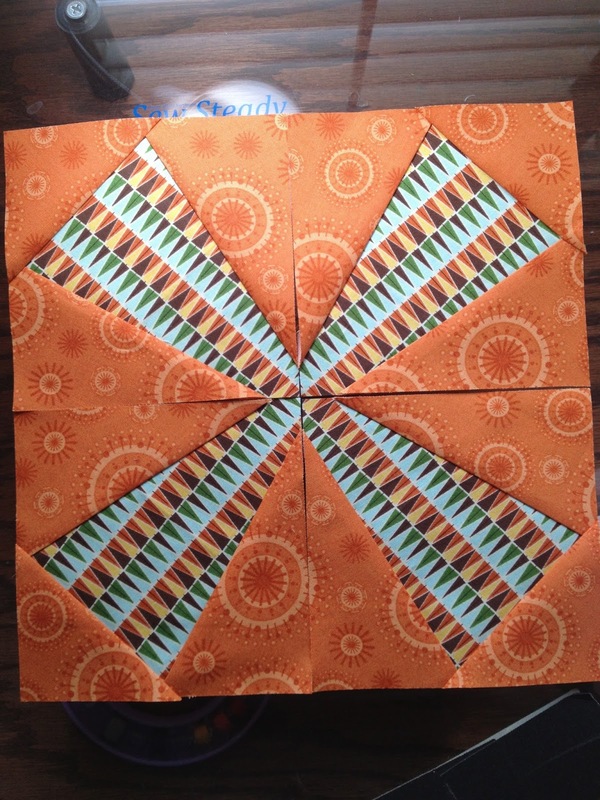 Create 4 smaller blocks to make one larger x block. Switch over to your ¼” foot and increase your stitch length back to 2.5. 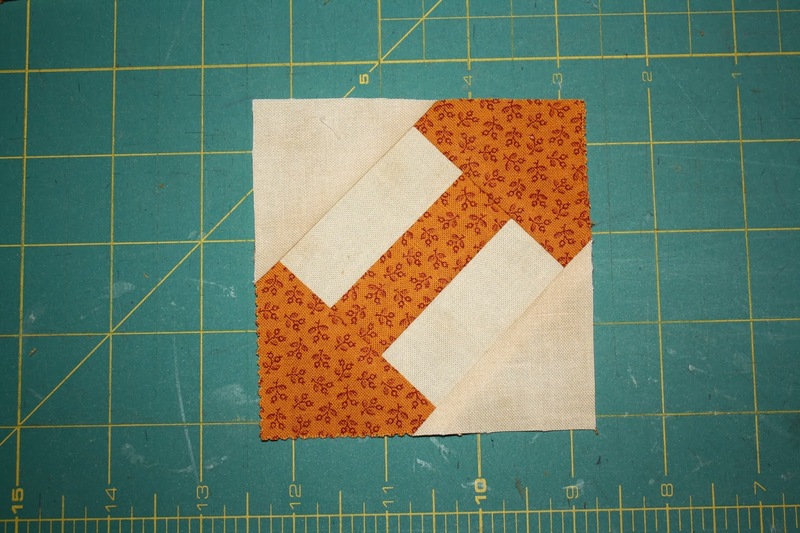 Join the bottom two blocks and the top two blocks and then sew the top row and bottom row together for a completed X block. Make 16 of these blocks choosing assorted prints from your fat eighth bundle and backgrounds from your three background fabric choices. Lay out the blocks on point, alternating a solid square between each block. 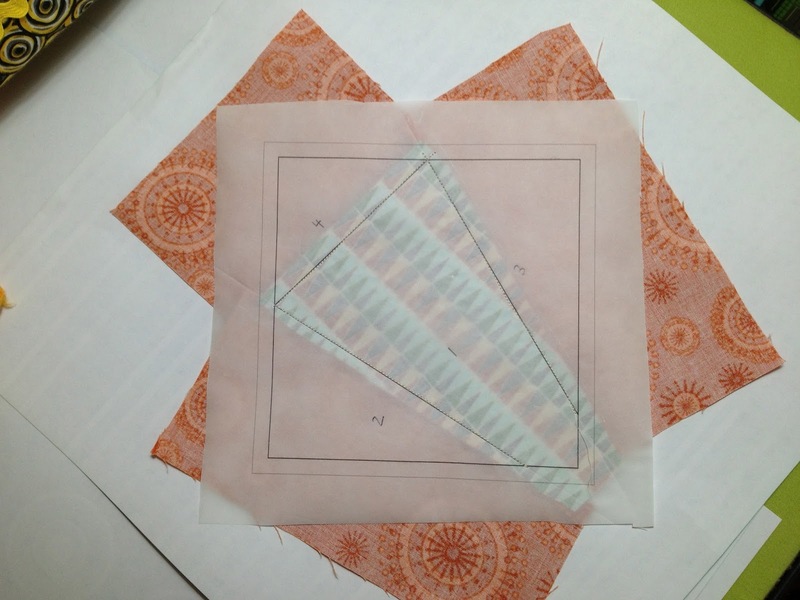 If you are using a fabric where the orientation of the design matters, keep in mind as you cut that you will be laying these out on the diagonal. Blocks are now on the bias, so be aware of stretching. A design wall is invaluable for a layout like this – I needed to make sure the wood grain on my brown blocks all went the same way. Now is a good time to cut the wood blocks and setting triangles if you have a directional print that matters for these blocks. I like to cut these blocks a little generous to make sure there is plenty when it comes time to trim them down. Here is the corner all trimmed up. 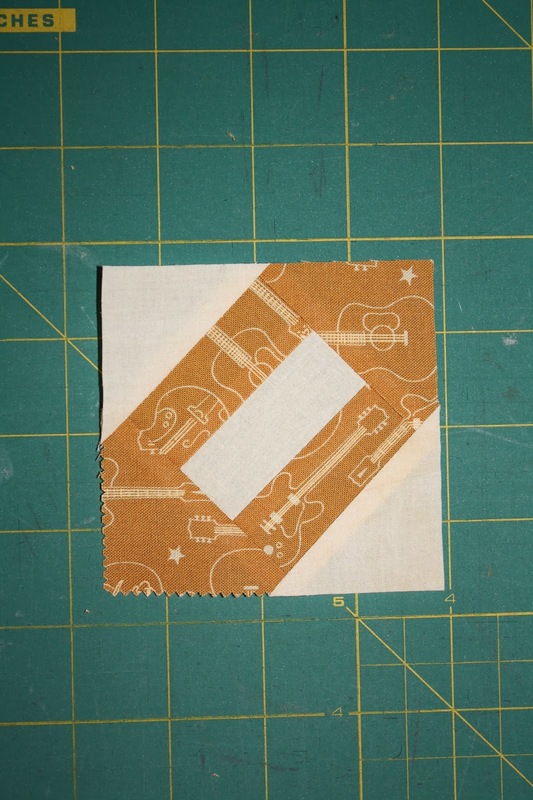 Make a quilt sandwich with your favorite batting and your backing. The back will need to be pieced since it is larger than the width of standard fabric. Quilt and bind according to your favorite method. 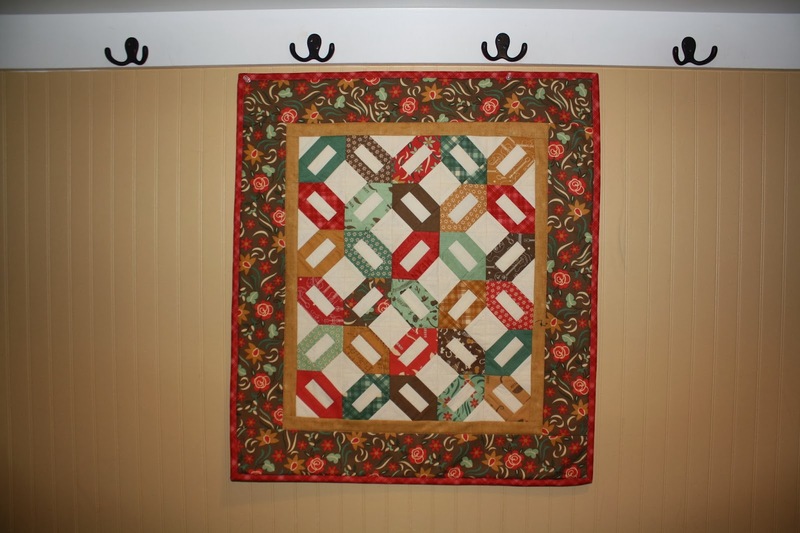 I opted for a simple straight line quilting design to mimic the wood grain in the background. 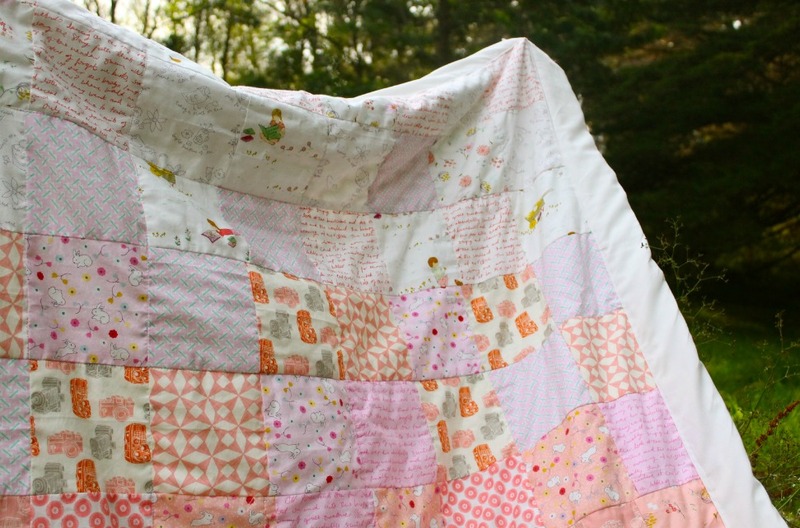 58″ x 58″ lap size quilt, perfect for snuggling up in front of the fire on your family camping trip! Hi Everyone! 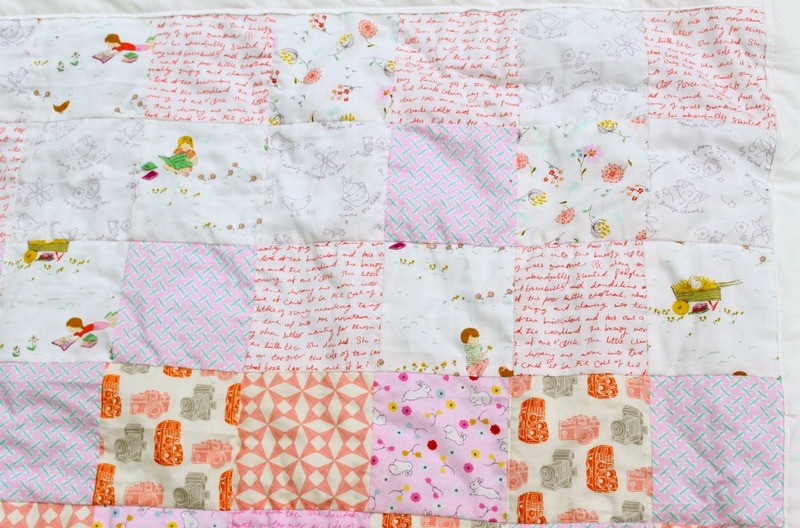 I’m so pleased to be back here with a fun and easy project that is absolutely perfect for the beginner quilter (or for those who need to whip up a quick-yet-pretty gift). 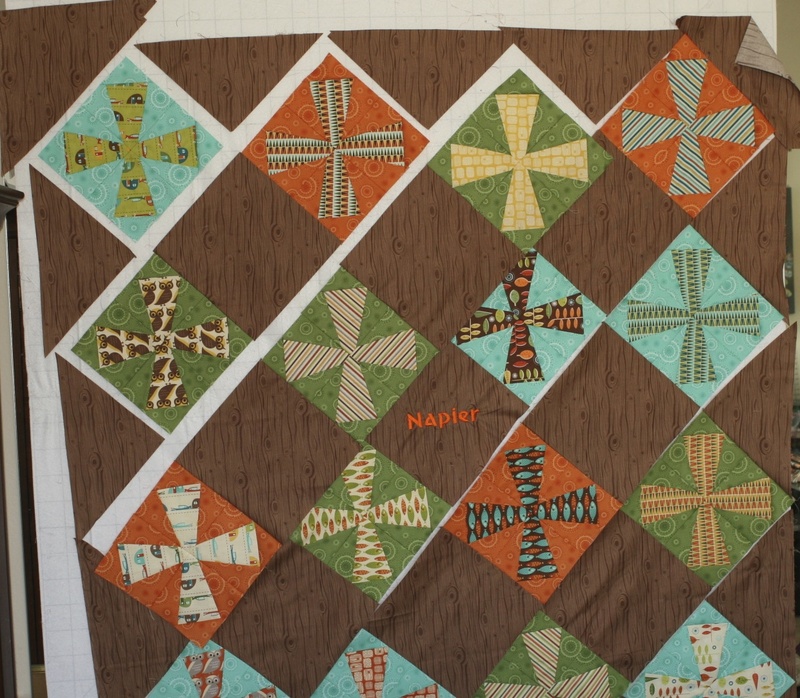 The layout of this quilt is very simple and works with many pre-cuts – fat quarters, layer cakes, or charm packs. 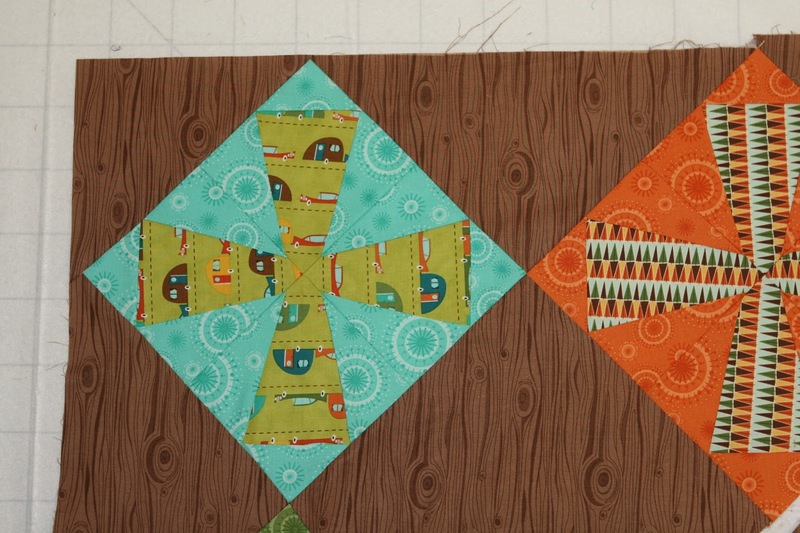 The trick is blending the fabrics from two different lines. 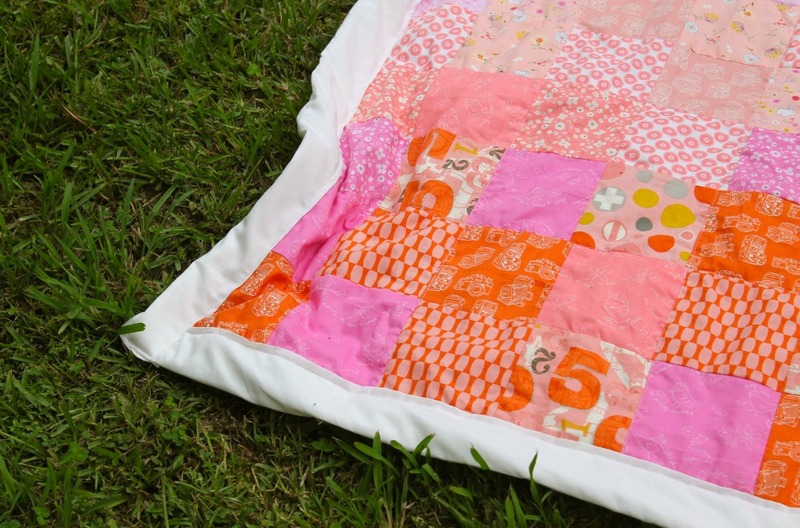 I made this one with my daughter and it makes a great kids’ sewing project. 5 to 6 charm packs (choose lines that have lots of pink in different shades) – I used Posy by Aneela Hoey & 2wenty Thr3e by Eric and Julie Comstock. From your charm packs, select fabrics with pink or white hues. Try mixing warms and cools too, as I did. I even used a bit of orange. The results are actually very pretty. 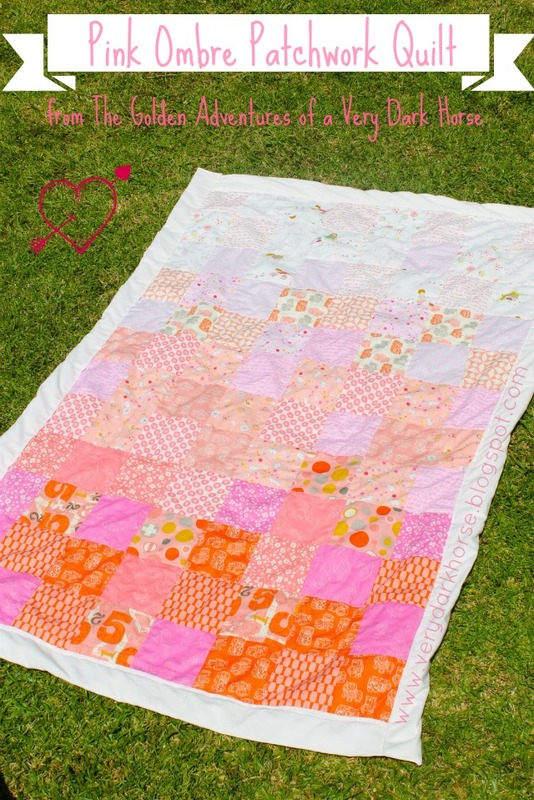 Because you will be creating a quilt from dark to light, ensure that you have a nice even mix of both, along with a good amount of mid-range pink (or whichever colour you have chosen. Say a mixture of five or six darker pinks/reds/oranges, five or six whites (with a touch of pink), and the rest in mid-range pinks. Lay the charm squares on the floor and work out your desired design, ensuring that you gently blend the colours from dark to light. Take a photo of this design to help ensure you get it right later on. 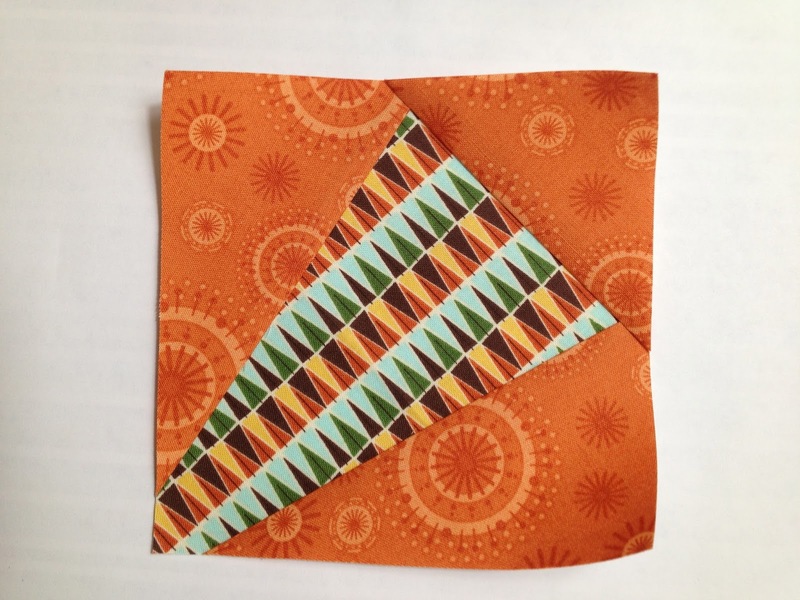 Begin assembling your quilt in rows of eight, with a 1/4″ seam allowance for each seam. Attach the strips together, either as you go or all at the end, your preference. I gave my quilt top a good iron before sandwiching and quilting the top (very basic quilting – I am still very much a beginner quilter!). Bind and quilt as desired. I used a white binding, but soft pink would look lovely too… Didn’t I tell you it was easy?! 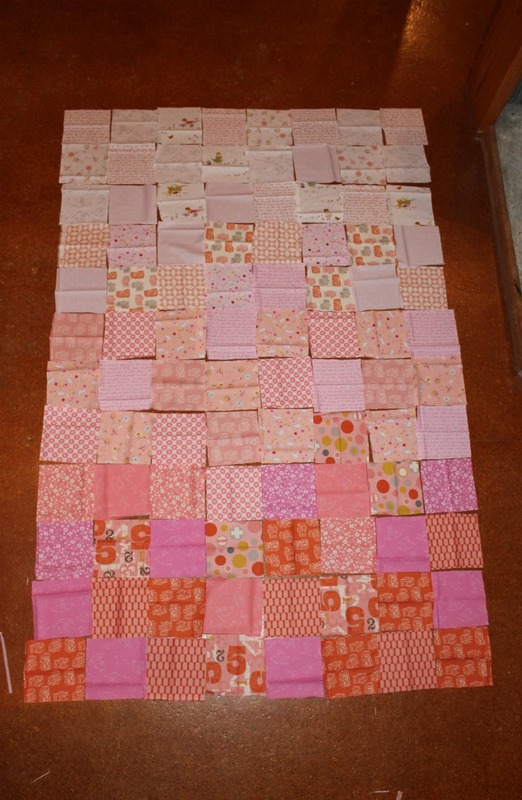 One small 40′ by 60′ single quilt for a pink-mad girl. This would be a fun (and even easier) project using charm squares if you have enough pinks and whites – no cutting required! Use fat quarters or layer cakes to make a larger version, and you can easily recreate this project using any colour you wish! Hi there! 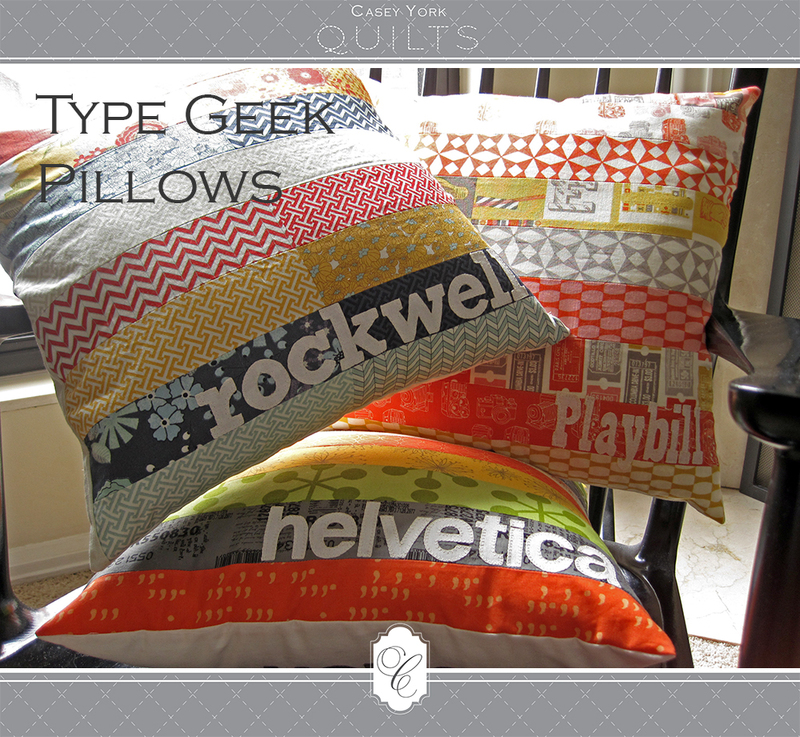 It’s Casey from Casey York Design and Studioloblog.wordpress.com, and I’m back to share the pattern for my Type Geek pillows. I am a self-professed type geek, myself, so I couldn’t resist coming up with a project for Typography month on the Moda Bake Shop. 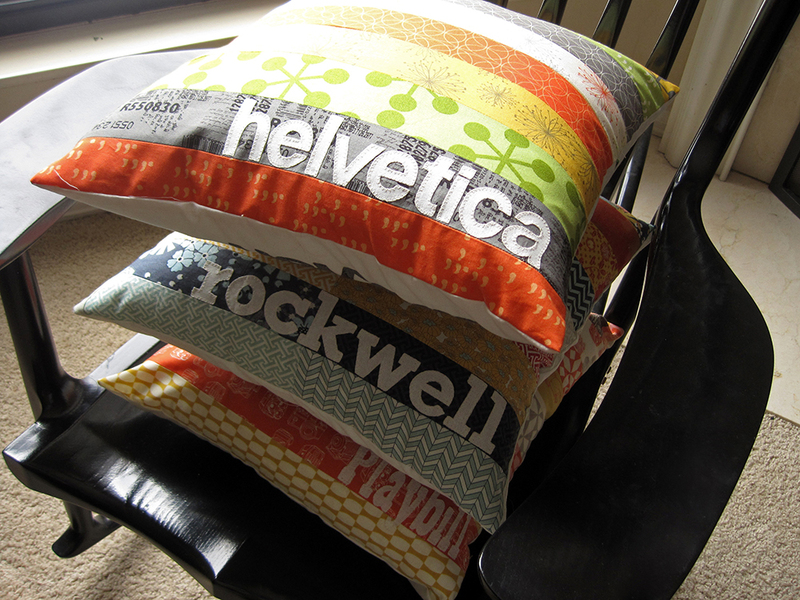 These pillows are a perfect way to showcase your favorite fabric collections and fonts. I had so much fun matching typefaces to fabric lines that I couldn’t stop with just one pillow and ended up making three. You can find the templates for these three appliqued words in the Printer Friendly version of this tutorial at the bottom of this page. 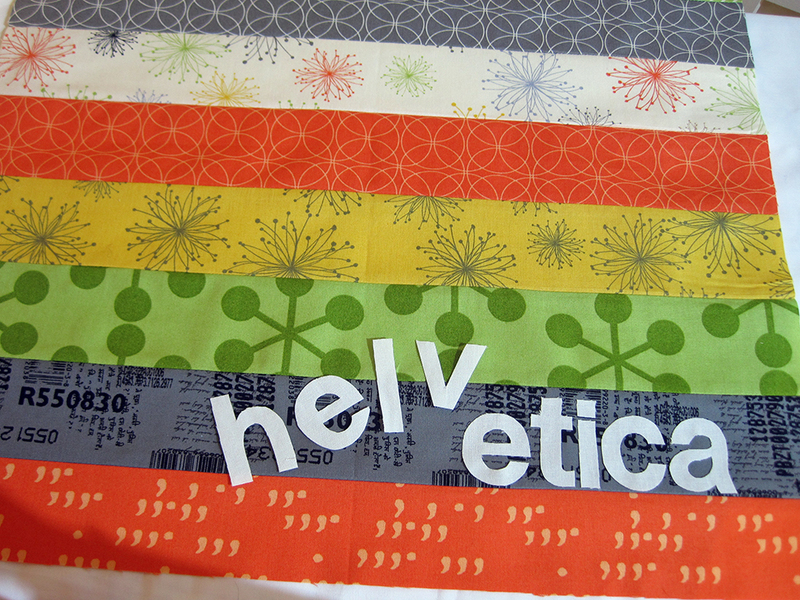 However, it’s easy to create your own templates, and this project is even more fun if you make up your own fabric-font pairings. I hope you have as much fun with this project as I did, and that you’ll share your finished pillows with me through the Casey York Quilts flickr group! 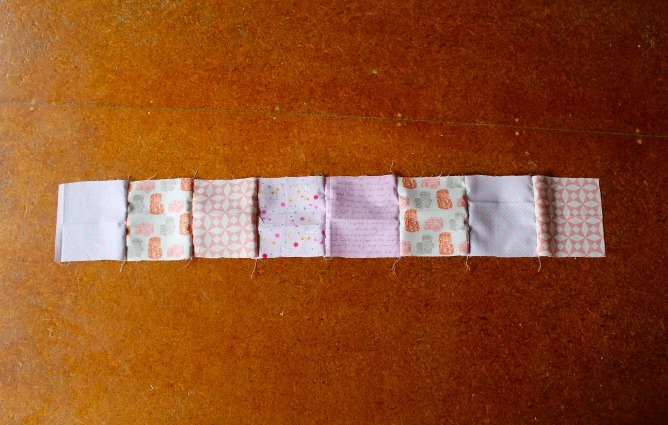 Please note: this pattern uses only (9) jelly roll strips, resulting in a lot of leftover fabric. You may want to plan another project to use the excess—I recommend one of the other wonderful tutorials here on the Moda Bake Shop! Tip: For maximum contrast, try to position a darker print or near solid as the second stripe from the bottom. This will ensure that your white appliqués show up well. Reserve the rest of this strip for the appliqués on the back of the pillow, which you will make in Step 2. Print the template for the typeface of your choice—this tutorial features Helvetica, Rockwell, and Playbill. You will only need one template page per pillow. 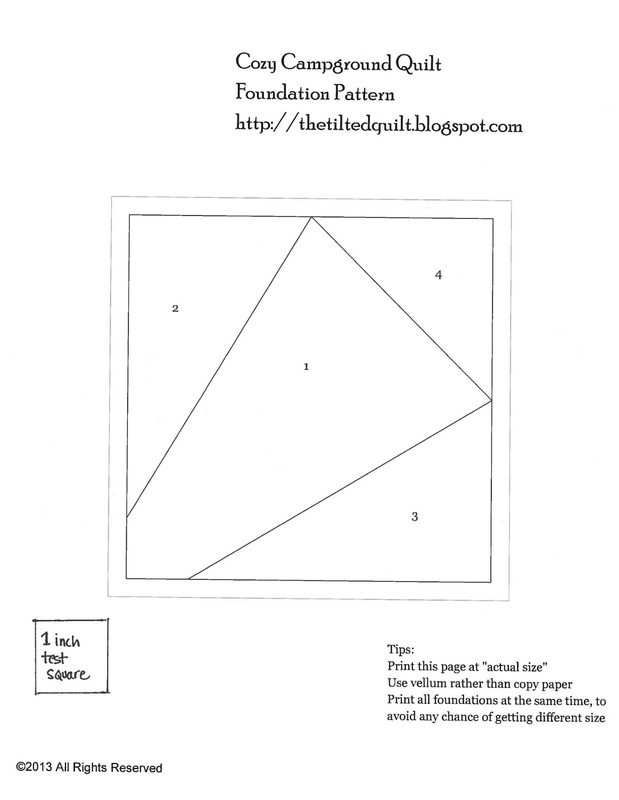 Templates can be found in the printer friendly version of this tutorial linked at the bottom of this page. Tip: Make your own templates: Select a favorite font from your computer’s word processing program (bold san serif or slab serif fonts work best for this project). Type out the name of the typeface, then enlarge the character size until the letters are approximately 2” tall. This generally works out to be a type size of 180 to 210 pt., although this will differ from typeface to typeface. Print your template; for the pillow front appliqués, reverse the letters by turning the page over and tracing the outlines of the printed characters on the back. Use your templates to make fusible appliqués as follows. Following the manufacturer’s instructions, trace the templates onto the double-sided light fusible web. Cut out roughly, leaving a ¼” margin around your traced lines; you may want to cut out the entire word rather than cutting out each letter individually. 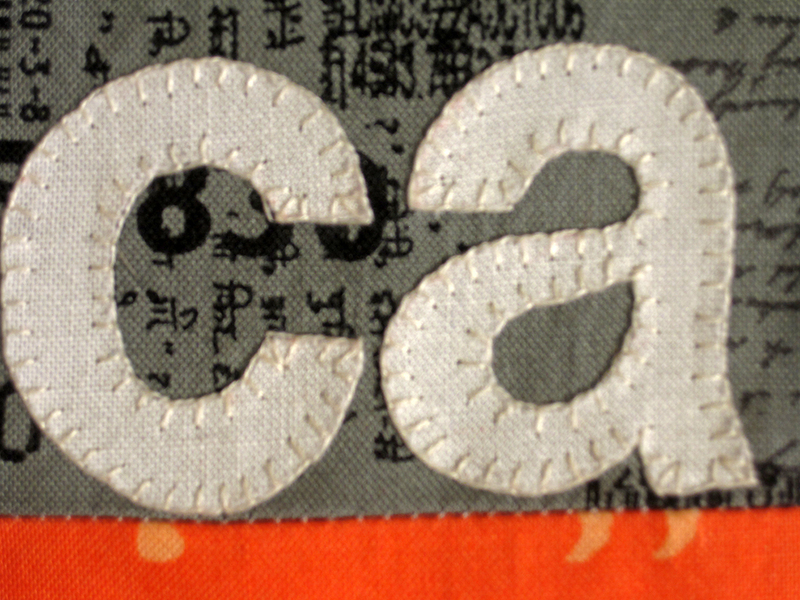 Fuse the letters that appear reversed onto your white appliqué fabric. 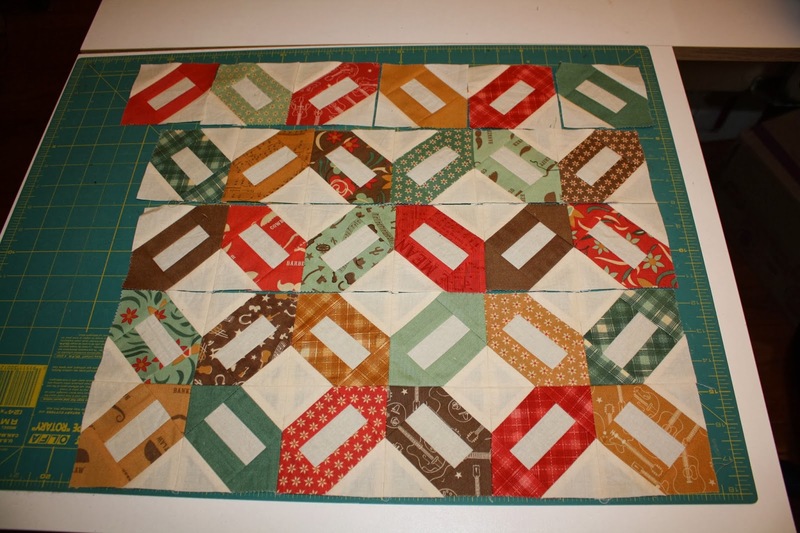 Fuse the letters that appear correctly oriented onto the wrong side of the jelly roll strip you reserved from Step 1, or a different strip that matches the second stripe from the bottom of your patchwork panel. Make sure to use a pressing cloth between your iron and fabric in order to avoid getting sticky residue on your sole plate. Position your white fabric appliqués on the patchwork panel, aligning them with the bottom edge of the second stripe from the bottom. You will want to make sure that the last letter is at least 1 ½” from the right hand edge of the panel to leave room for the seam allowance. Tip: Begin laying out your letters from the right-most letter and move left (i.e. backwards) towards the left side of the panel. When you are satisfied with your layout, fuse the appliqués in place, again using a pressing cloth between fabric and iron. Stitch around the appliqués using your machine or by hand; the samples were stitched by hand using a blanket stitch and a single strand of six-stranded cotton embroidery floss. From the solid white fabric, cut two rectangles measuring 17 ½” wide X 8 ½” long and 17 ½” wide X 11 ½” long. 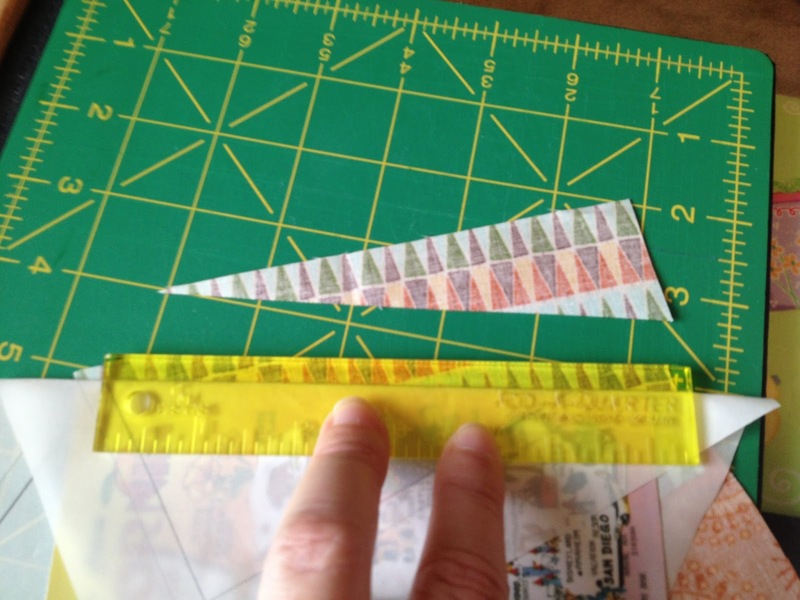 Fold one long edge of the 17 ½” X 8 ½” rectangle back 1 inch and press well, creating a crease. Make sure the zipper is zipped. Unfold the crease in the 17 ½” X 8 ½” rectangle and place with the crease facing up; this is the right side of your pillow back. Place zipper face-down along the 17 ½” edge closest to the crease and align long edge of zipper tape with edge of fabric; pin well. Your zipper will be slightly longer than your pillow back is wide; to create a new “stop”, simply stitch back and forth several times across the zipper teeth at the point where the zipper reaches the 8 ½” edge of the fabric. 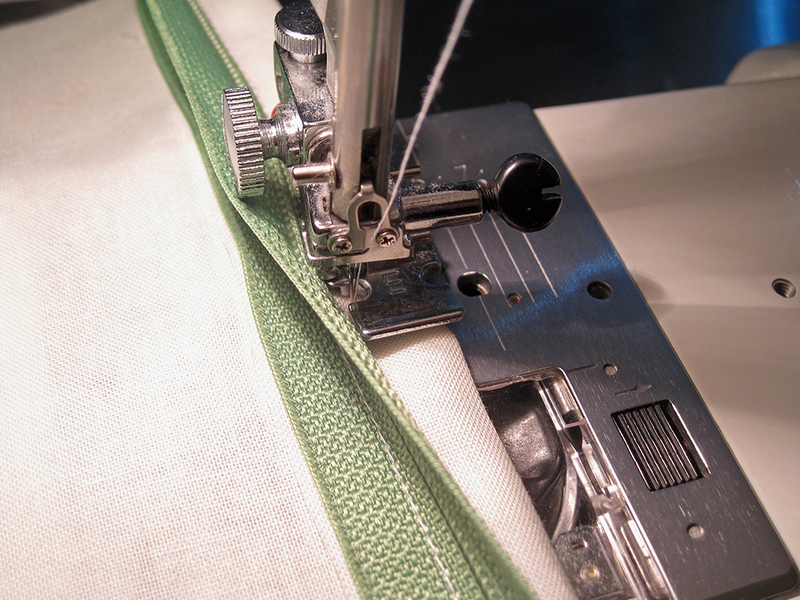 Use your machine’s zipper foot to stitch as close to the zipper teeth as possible. When you approach the zipper pull, lower the needle, raise your presser foot, and carefully unzip the zipper until the pull is behind your needle. Lower the presser foot and continue stitching to the end of the zipper. Refold crease; stitch along fold as close as possible to the zipper, making sure not to catch the zipper tape in your stitching. This will create a placket to cover the zipper. Unzip the zipper. Place the tape face down against a 17 ½” edge of the 17 ½” X 11 ½” rectangle and pin well. Stitch as close as possible to the zipper teeth. This time, when you reach the zipper pull, carefully zip the zipper until the zipper pull is behind your needle. Continue stitching to the end of the zipper. Zip the zipper, place pillow back right side up, and press well. You should have a 17 ½” X 17 ½” square (if slightly larger, trim to measure 17 1/2″ X 17 1/2″). Baste along side edges to hold zipper together when you assemble the pillow cover. Place your pillow front right side up. Place the pillow back on top with the right side facing down, the zipper towards the top edge, and the edges aligned. You should be able to see your front appliqués through the white fabric of the pillow back. Use a removable fabric marker–I recommend a Hera Marker or other creasing tool–and your ruler to trace lines along the bottom and sides of the word on the front of the cover. These will be your guidelines for placing the appliqués on the back. Turn the pillow back right side up and use the guidelines to place your back appliqués; the letters should be backwards. When you are satisfied with your placement, use your iron to fuse them in place. Stitch around appliqués using your machine or by hand. Tip: If you use a fabric marker or pencil to make your placement guidelines, make sure you remove your markings before you use your iron to fuse the appliques in place! 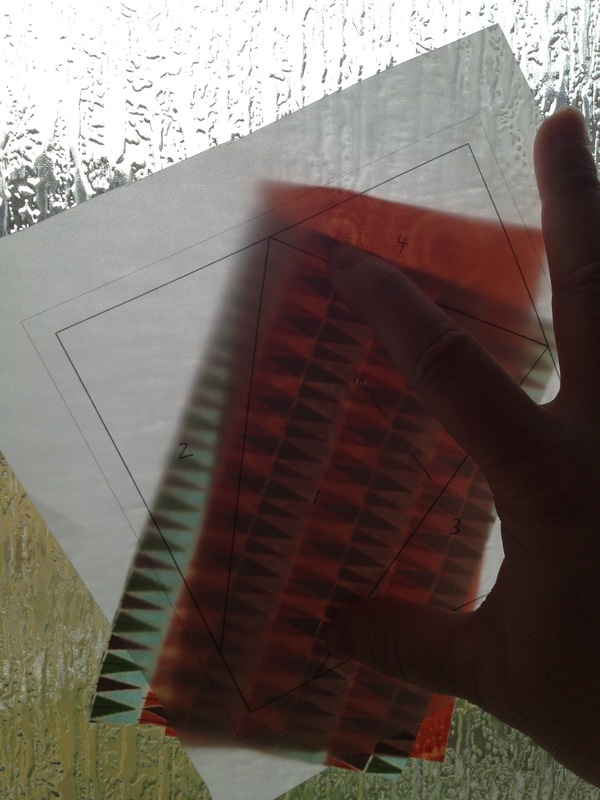 This is why I prefer to use a creasing tool for this step–I don’t need to remove any markings before pressing. Place pillow front cover and back cover together, right sides together. Make sure the zipper is unzipped a few inches. Align edges and pin well. 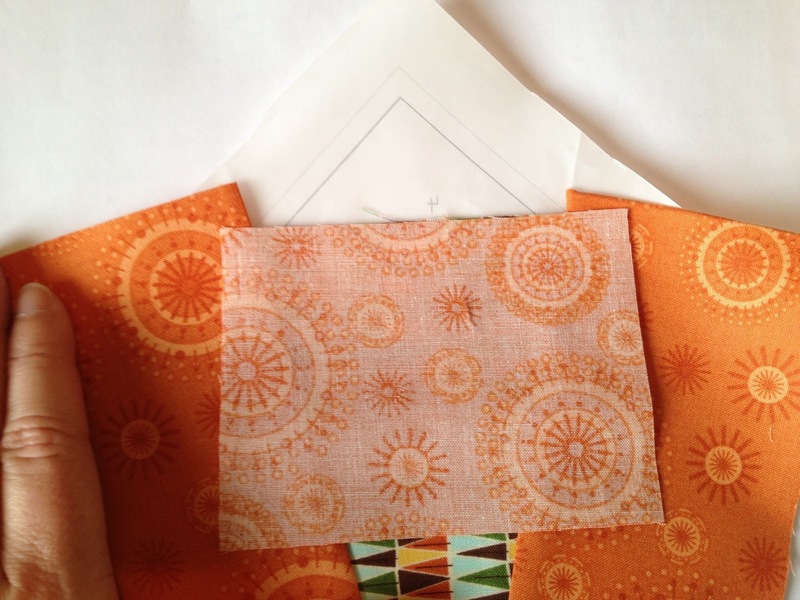 Stitch along edges with a ¼” seam allowance. If you wish, finish the edges with a zigzag stitch. Unzip zipper all the way and turn cover right side out. Insert an 18” X 18” pillow form and you’re done! This pattern will yield one cover for an 18” X 18” pillow. I recommend making several—have fun matching typefaces to the character of different fabric collections!